The Beastie Ball: The Best Massage Ball Created or a Waste of Money? I love trying out all kinds of myofascial release tools such as foam rollers and massage sticks, however, one of my all-time favourites are massage balls. Out of all the massage tools I’ve tried, I’ve found that I’ve gotten the most release from massage balls. I find them perfect for hitting deep knots and trigger points whilst at the same time providing a gentle massage for tight and tense areas. Then I came across the Beastie Ball. All the spikes! The name! Just by looking at the Beastie Ball I knew I had to try it out one day. Lucky for me I managed to purchase one the other day and have spent some time getting to know the Beastie Ball. After a day or so I have come to my own overall conclusion on the Beastie Ball and how it compares to other myofascial release tools. If you’re interested in buying a Beastie Ball and aren’t sure if it’s worth putting down your hard earned money for one, then this review of the Beastie Ball will be of interest to you. In this review, I’ll briefly discuss what the Beastie Ball is, how it works, the pros and cons, who should buy it, who should not buy it as well as covering the areas of the body it works best on. What Is The Beastie Ball? The Beastie Ball is a massage ball from the same team who produced the Rumble Roller, which is a special foam roller designed to provide a deeper massage than a traditional flat surfaced foam roller. The Rumble Roller is known for its extremely aggressive style of trigger point release accomplished by deep and hard ridges on its surface. The Rumble Roller is not for the faint-hearted as it can be pretty painful to use (as I found out and documented in my Rumble Roller review). 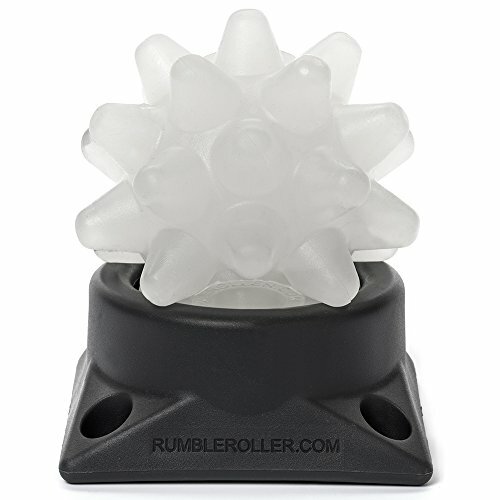 The good news (or for some bad news) is that the Rumble Roller team have made a massage ball which is equally as tough as their Rumble Roller product. The deepest, most aggressive, way-better-than-a lacrosse-ball, nasty knot-busting massage ball ever created. To put it simply, the Beastie Ball is a massage ball that is a level up from a lacrosse ball in terms of trigger point release… and it’s going to hurt! How Does the Beastie Ball Work? To use the Beastie Ball you would position it in such a way that the spikes rest on parts of your body that are tight and tender. By holding the Beastie Ball onto these areas and applying adequate amounts of pressure, the tender areas should ‘release’ and leave you feeling better in those areas of the body once you’re done. The beauty about the Beastie Ball is that its spikes can not only dig deeper, but you can also gain more precision than a standard flat lacrosse ball. The spikes and firmness of the Beastie Ball are what sets it apart from a traditional massage ball. In addition, it comes with a base to prevent it from rolling around like other balls. Now we know the basics of the Beastie Ball, we can now delve more into the actual product and review. I had to wait some time before I could buy my own Beastie Ball. I’m in the UK and only really like buying products from Amazon.co.uk which proved to be a problem as the Beastie Ball has not been available at a decent price on Amazon until recently. You can buy the Beastie Ball in the UK from Rumble Roller’s official site, however, they do charge for shipping unless you purchase over £50 worth of products. I decided Amazon was the best choice and got my Beastie Ball for around £22 (approximately $30). The Beastie Ball comes well packaged in its own small box with a short paper manual on best practices. You can also view the user-guide for the Beastie Ball here. Also in the box is the Beastie Ball itself as well as a base which holds the Beastie Ball steady during the massage if needed. The Beastie Ball is easily detachable from the base and can be secured in place by the spikes of the Beastie Ball. The Beastie Ball is very tough and about the same firmness as a lacrosse ball. The base is equally as tough and durable. I would be very surprised if someone managed to break either the Beastie Ball or the base. It’s just not going to happen. Therefore the Beastie Ball should last you a lifetime for sure. Before getting into the nitty-gritty of the review it’s important to first point out that this is a review of the X-FIRM option as opposed to the Original firmness model which will be softer. In this section, I’ll cover which areas the Beastie Ball worked best for me. The first place I tried the Beastie Ball was on my calves. I’ve often found releasing my calves challenging because of how small some of the trigger points can be in this area. A Lacrosse ball can only release so much, however, the Beastie Ball provided a greater release on my calves as I managed to hit a lot of points that were previously inaccessible. When using the Beastie Ball you can focus on using the top spike and through that feel the fibres of the tender muscles. This provides an incredible release that a lacrosse ball cannot achieve. What’s more is that the base provided the steadiness that prevents the ball from moving which allowed for greater accuracy. The Beastie Ball is fantastic for the calves. I have a lot of trigger points around the top of my upper back particularly around and in between the shoulder blades. The top spike of the Beastie Ball is narrow enough for me to locate the tender spots with precision. The fact that the Beastie Ball is held in a stable base also helped. Surely the worst idea ever? When I originally saw the advert for the Beastie Ball, one of the images they showcased was the image above of a man using it on the back of his neck. Given how hard the Beastie Ball felt in my hand I thought that this couldn’t possibly work, but it did! Taking the Beastie Ball out from its base, lying on your back and placing it in that little cove area behind the ear and the top of the neck feels great. I’ve always tried to hit this area before thinking that a peanut massage ball was the best tool for this. I have to say that the Beastie Ball is the best myofascial release tool for this area. As well as for the back of the neck I was very surprised that the Beastie Ball worked very well to release all the way around the neck including the front. To achieve an all-round trigger point release of the neck you wouldn’t use it on the floor, but instead hold it in your hand, apply gentle pressure on your neck and move the Beastie Ball in small circular movements. I’ve been using this method with the Triggerpoint massage balls and the Thera Cane, but the release with the Beastie Ball is much better because the rubbery spikes grip the skin and muscles effectively. There are other areas that I feel the Beastie Ball could work well on but because I have already released most of these areas, I didn’t feel the full effects of the Beastie Ball. Pecs – The spikes would be perfect for the pec muscles, particularly getting into the pec minor muscles that run down the side of the pecs. These are difficult muscles to hit but the Beastie Ball would be able to dig into them better than any other tool I can think of. Triceps – The Beastie Ball could work on the triceps, however, I prefer using a lacrosse ball because it’s not an overly fleshy area. Forearms – Much like the triceps the Beastie Ball will work, but I would go with a lacrosse ball. Quads – You can use the Beastie Ball on your quads but I’d be very wary against using them towards the lower parts of the quads as this could be particularly painful. Using it on the upper fleshy regions would work but venturing too high up (around bony areas) could be problematic and a lacrosse ball would be a better option. Hamstrings – I didn’t find much use in the hamstring area, as my hamstrings aren’t a problem area for me, but it did help somewhat along my inner thigh where I do have problems with tightness. That being said if you do use them in the hamstring area the Beastie Ball may be better without the base and your leg should be bent at a 90-degree angle rather than straight out in front of you to get the best results. Upper Traps – To target the upper traps, I found its best to use your hand to manoeuvre the Beastie Ball into your traps rather than using a wall. I would prefer to use a lacrosse ball and a wall for my upper traps, rather than the Beastie Ball. It is important to note that everyone’s body is different and some people are tighter in some areas than others. This will change the opinion on how well a massage tool works in certain areas. The best thing to do is to test it out for yourself. Should You Buy The Beastie Ball? I rate the Beastie Ball highly and will definitely become one of my favourite go-to myofascial release tools. That being said, I don’t think it is for everyone. For one, it is very firm and almost too firm at times. When I first used it on my calves, I didn’t realise at the time but I was applying too much pressure and getting carried away. The next day I woke up with bruises all along my calves, which is something I have never experienced from any other myofascial release tool. This means you need to take a lot of care when using Beastie Ball. I would not recommend putting your full body weight onto the Beastie Ball whilst on the floor, especially if you are on your back or bony areas. Secondly, as well as needing to take care with the Beastie Ball, it is going to be too painful for newbies to use. If you haven’t outgrown a lacrosse ball yet then the Beastie Ball may be a step too far. It would be best to make sure you have a good level of trigger point release with other more general myofascial release tools, such as a foam roller or standard massage balls before trying the Beastie Ball. One thing I must highlight once again is that this review is based on the X-FIRM firm option and not the original option. It could be that the Original option may be suitable for a beginner, however, I can’t say this for certainty as I haven’t tested it. If you are a beginner and are dead set on buying a Beastie Ball, then you may want to go with the Original option or buy both the original and x-firm balls together. For those who are finding that a lacrosse ball cannot release some of your trigger points then the Beastie Ball is a perfect myofascial release tool for accomplishing this. 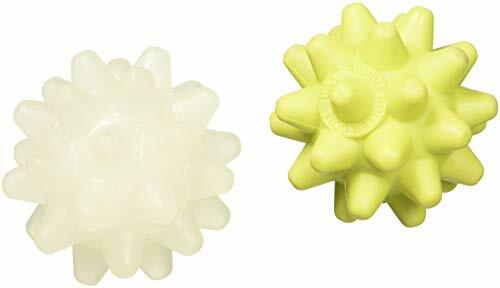 I’ve tried both the Body Back Buddy and the Thera Cane and found the Beastie Ball more effective because the spike on the Beastie Ball is smaller and more grippy than the knobs on the mentioned massage sticks. I found the trick to getting the most out of the Beastie Ball is using it against a wall as opposed to on the floor. By using a wall you can get better control of the pressure you apply on to your trigger points which is important due to the firmness of the Beastie Ball. 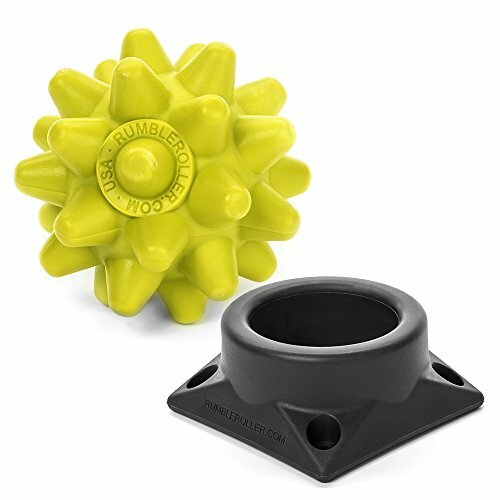 Given how well the Beastie Ball works against a wall, I can understand why Rumble Roller have so many accessories for the Beastie Ball which involve wall mounts. Is the Beastie Ball better than a Lacrosse ball? I wouldn’t say it’s better than a lacrosse ball in a general sense. I still love my lacrosse ball because it is able to provide a general but firm massage over a large area. The Beastie Ball, on the other hand, is not a general ‘feel good’ massage tool but a tool to release small trigger points that are hard to reach. They both achieve different things but a lacrosse ball is more versatile overall. 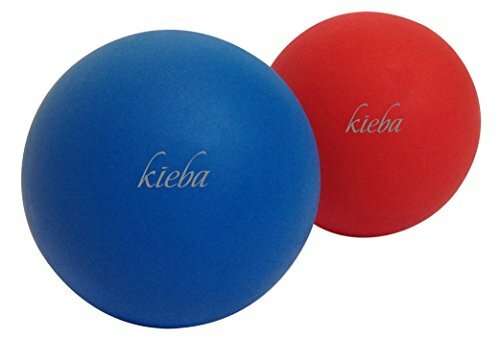 Despite the differences, I now consider the Beastie Ball and the Lacrosse ball as essential tools to have in any myofascial release tool-kit. Which one you pull out depends on what your body needs most at the time. Overall I highly recommend the Beastie Ball but be prepared for a lot of pain at the same time. It will take time to get used to and understand how it works best for you. The Beastie Ball is and does what it is intended to do. It’s aggressive, goes deep and is effective in ‘knot busting’ more than any other myofascial release tool I have tried. Its also small and light so you can take it with you when you travel. The quality is good too meaning it will last a long time. In addition, you can upgrade the Beastie Ball by attaching it to the wall or a stick if you want to take your experience to the next level. The Beastie Ball is incredibly simple but effective. It’s definitely one of the best tools for deep trigger point release I’ve tried and I highly recommend giving it a try!